Living in San Antonio, Catherine Amitrano has been writing health-related material since her nursing career began in 1985. Her presentations have been used to teach many nurses throughout her successful career. She holds a master's degree in nursing and is certified in her specialty and in life care planning. Kiwifruit originated in China where it was once considered a delicacy. 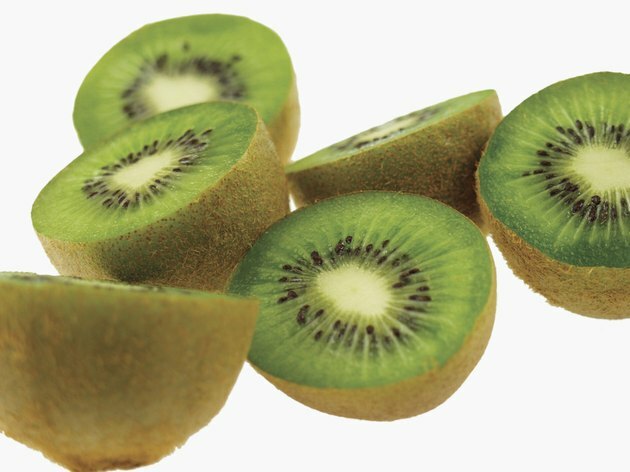 Kiwi was introduced into North America in the 1960s; since then, many have enjoyed the unique taste of kiwi which blends a combination of strawberries, pineapple and bananas, notes the author of the book, "The World's Healthiest Foods." One medium kiwifruit weighing approximately 76 g, or 2.6 oz., contains only 46 calories. Kiwifruit contains no fat and carbohydrates weigh in at 11 g, or 4 percent of the Daily Value, based on a 2,000 calorie diet. The amount of Vitamin C in one kiwifruit surpasses the amount seen in an orange, claims Mateljan. Consuming one kiwi delivers 95 percent of the Daily Value, or 570 mg, based on a 2,000 calorie diet. Kiwi is also a good source for potassium, copper, magnesium and Vitamin E.
Kiwifruit is a very good source of dietary fiber which helps maintain a healthy digestive system. One medium kiwifruit contains 3 g of fiber or 10 percent Daily Value. Why Eat Kiwi When You're Pregnant? What Vitamins Do Watermelons Contain?